The staff online portal to access documents. Click on the staff/student button on this page. It will then take you to your SiD/Moodle page. 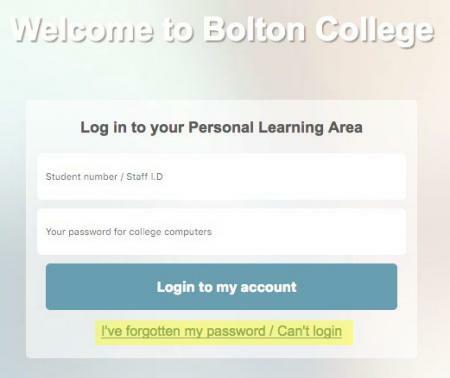 Click on the button 'I've forgotten my password/Can't login' button as highlighted in the image below. You will need to send an email from your personal email account (not your College account). Please send an email to help@boltoncc.ac.uk and put the word 'Password Reset' in the subject header. Within a few minutes you will be emailed with your new password. If there are any problems with changing your password you will be emailed the details of the problem with instructions on what to do next.